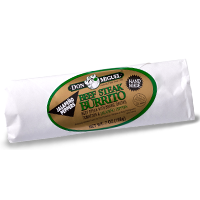 Big bold Mexican flavor is packed into every bite of DON MIGUEL® Steak & Jalapeño Deli-Style Burrito. 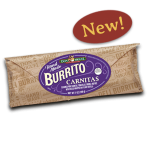 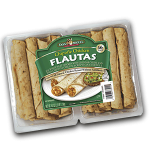 Meticulously hand rolled in a traditional hand-stretched tortilla, and then filled with generous amounts of seasoned beef, hearty beans, flavorful onion and fiery jalapeño chilis, this burrito is perfect on the go, day and night. 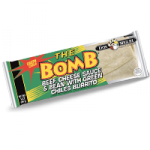 Find it at your local convenience or grocery store deli today. 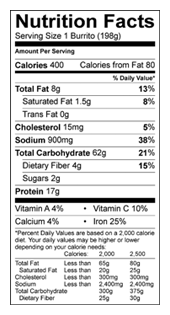 Beef steak strips (beef, water, less than 2% salt, dehydrated garlic, dehydrated onion, chili pepper, spice, cane sugar, grill flavor [tapioca dextrin, sunflower oil, tricalcium phosphate], natural flavors, flavoring), cooked beans (water, beans), water, onions, jalapeño peppers (jalapeño peppers, water, vinegar, salt, garlic powder, calcium chloride), tomatoes (tomatoes, tomato juice, citric acid, calcium chloride), modified food starch, green chiles, bell peppers, contains 2% or less of: vinegar, hydrolyzed corn gluten, hydrolyzed soy protein, hydrolyzed wheat gluten, dehydrated onion, dehydrated garlic, dehydrated red chile pepper, salt, dextrose, flavorings, spices, disodium inosinate &disodium guanylate, modified corn starch, spice extractive.